There they were; walking the Road to Emmaus. It was the third day since the crucifixion of Jesus Christ and they were talking about all of the events that had transpired over the previous three years. All of the healings. All of the miracles. Eyes that were opened and lips that were loosed. The lame now walked and the mute spoke and the Gospel of the kingdom of God was preached. Well, they didn't seem to care as much about that now did they? Not according to the key verse above. Jesus comes alongside of them to talk but kept them from realizing who He was as they walked. The key verse reveals their true lament. What really bothered them now that He was gone. They had hoped He would be the one to deliver Israel. The deliverance they speak of was deliverance from the oppression of Roman rule. Jesus of course always has a grander purpose as He came to deliver them from their sins. He came to deliver them from the clutches of Satan. He came to reconcile God to His wayward and sinful people. The Jewish people however had a pretty pious look about them. They had all the religious trappings. They had the temple and ceremonies. They had the long robes and the lengthy prayers. They did not view themselves as needing deliverance from the oppression they were clearly under. They were sitting under a false religious system. They were being taught by hypocrites. They had the pomp and circumstance of religiosity but their hearts were far from God. So far that they followed their religious leaders blindly and crucified their own Savior. A man who walked among them for three years and preached peace, love, and humility. But He also actively spoke against the false teachings and teachers of His day. He called them a brood of vipers and whitewashed tombs. He overturned their money tables in the temple and drove them out with whips. And after three years of miraculous and confrontational ministry, they saw to it that He was crucified. This link is to his latest attempt to put Christian lipstick on a carnal pig. Brown has become one of the adherents for the idolization of this country. 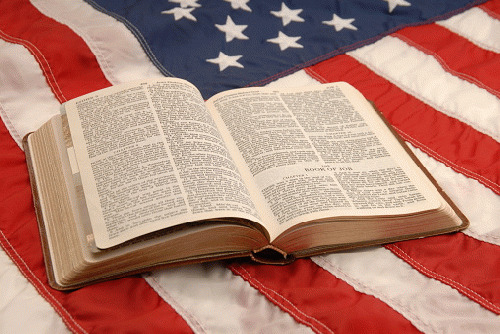 In his reality, America was once a great Christian nation that has fallen away from the Lord and needs to be revived or restored. Any sane reading of history will reveal that the majority of the founding fathers were seeking to escape from oppression and not set up a theocracy. Let us reason together and go through his latest attempt, deconstructing the carnal arguments he makes. First up, Dr. Brown sets the premise up by speculating what would happen if the "oppressive Johnson Amendment" is removed by Donald Trump, which has "muzzled preachers across America." For those who may not know, President Lyndon Johnson passed this amendment decades ago, which sought to limit the political opinions of churches and pastors who were receiving the federal tax exemption status as religious institutions. In the mind of Dr. Brown this amendment is a bad thing when the truth is that it is a blessing for the church today. We have a church that rarely preaches the Gospel of Jesus Christ to begin with. Can you imagine how much less they would if they were allowed free reign to preach politically? We would never hear about the cross, the blood, or the chance we all have to be reconciled unto God. Instead we would hear about how one candidate is "God's choice" or like we saw with the Catholic Church this past election cycle -- outright threats of being hell-bound unless you voted a certain way. Make no mistake about it beloved the Johnson Amendment is a good thing for the church that desperately needs to be reminded why it exists. Not to mention that if the church really wanted to get out from under this onerous restriction all they have to do is give up their precious 503C1 tax exempt status. You cannot lie down with a whore and then act offended when she asks for money. Brown's premise here though is that even if they removed the Johnson Amendment that cowardly pastors and preachers still would not take on the political responsibilities that he has undertaken. Yes Dr. Brown they should. The only way they can show that they care more about the health and well-being of their flocks is to preach the Gospel to them. It alone is the sustenance they need. Your solution is to preach more carnality to them. To explain how they can help restore Sodom to some false sense of former glory. The church does not need to keep turning to man for solutions. It does not need more politics. It needs to return to being a shining city on a hill. Salt and light to a dying world. It needs the only thing that has the power of God unto the salvation of man. It needs the Gospel. Dr. Brown needs to get off the road to Emmaus, stop lamenting why Jesus doesn't redeem this country, and get back to preaching the Gospel.